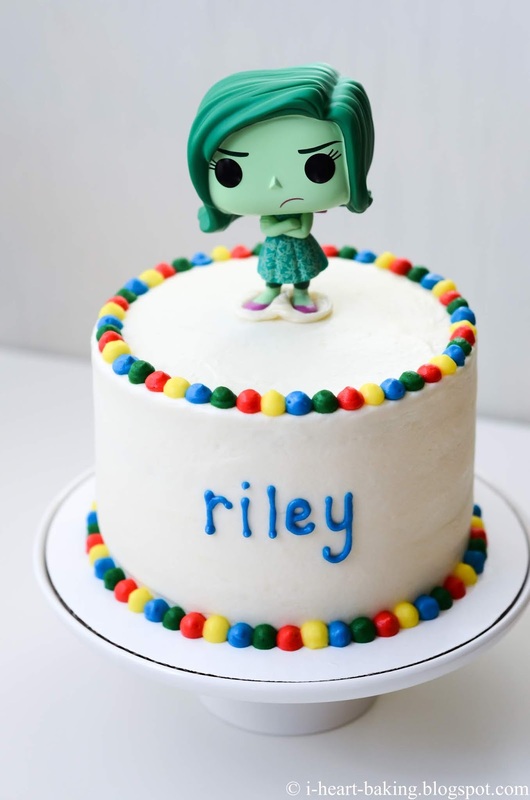 Some time ago, I made a "Tangled" Rapunzel cake for my friend Monica, and we used a Funko Pop Rapunzel doll as the cake topper. A few months later, my friend Stephanie asked me to make her daughter an "Inside Out" birthday smash cake, using a Funko Pop doll as well! 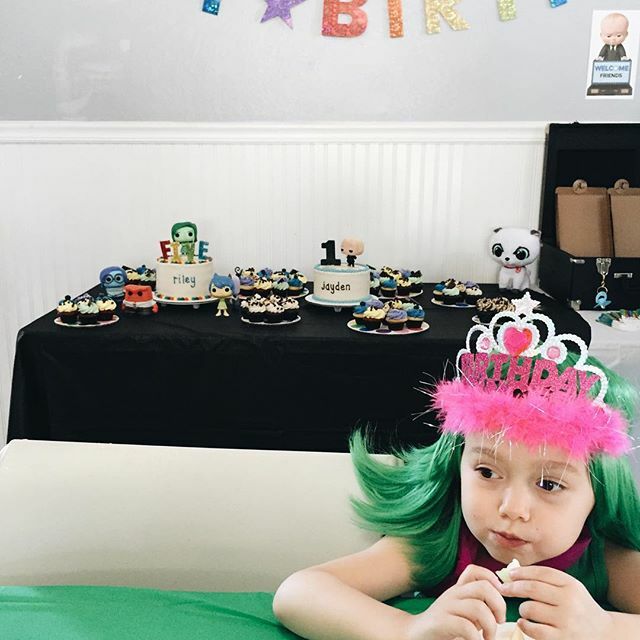 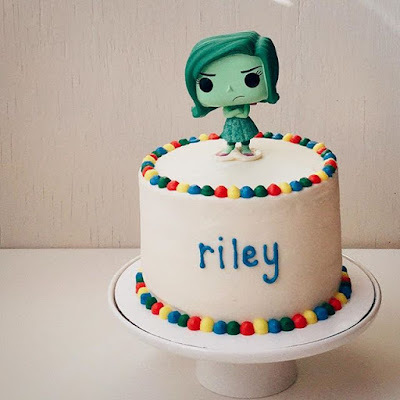 Her daughter Riley's favorite character from the movie was "Disgust", so we chose that as the cake topper! 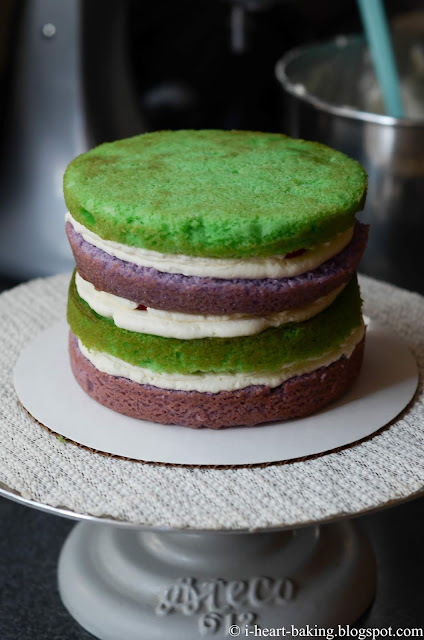 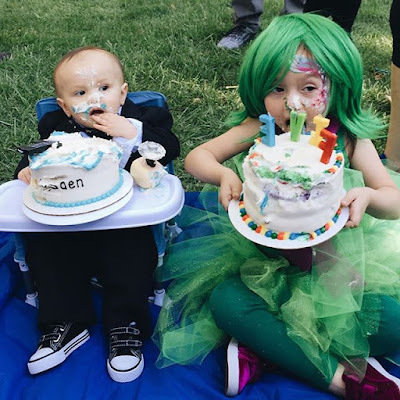 Since Disgust's colors were purple and green, she requested that layers of cake matched those colors, and so I baked up two 6-inch vanilla cakes, one tinted with violet and the other tinted with leaf green. 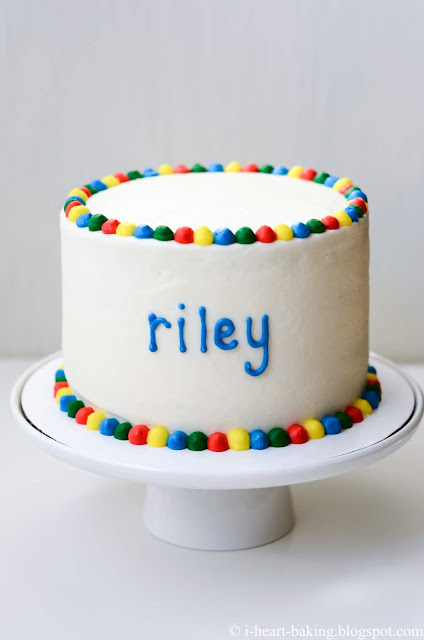 (You can find the vanilla cake recipe in my book, The Hello Kitty Baking Book!) 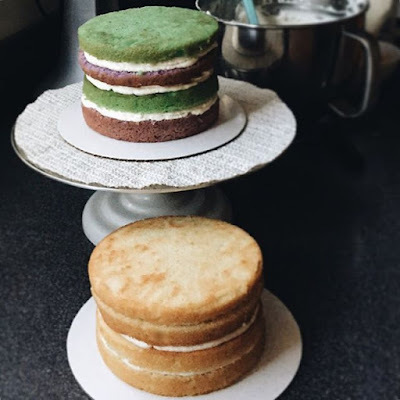 Then I sliced each cake in half horizontally, giving me four cake layers. Next I filled each layer with freshly whipped cream and fresh sliced strawberries, alternating the purple and green cake layers. 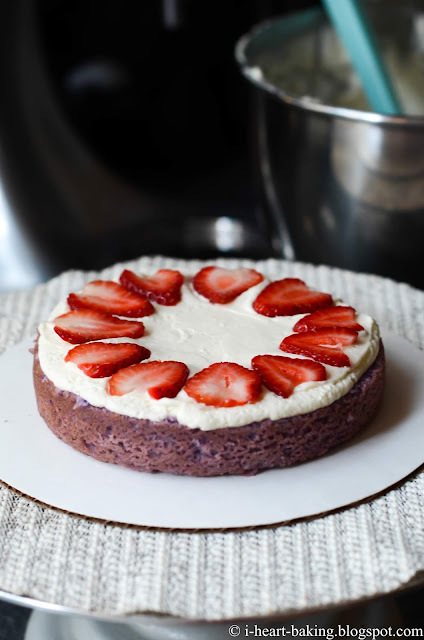 Once the cake was assembled, I covered it with cream cheese buttercream (I do this in two steps - first a quick crumb coat, then chill in the refrigerator for 30 minutes, and then I add a second smooth coat of frosting, smoothing it out with a large offset spatula). 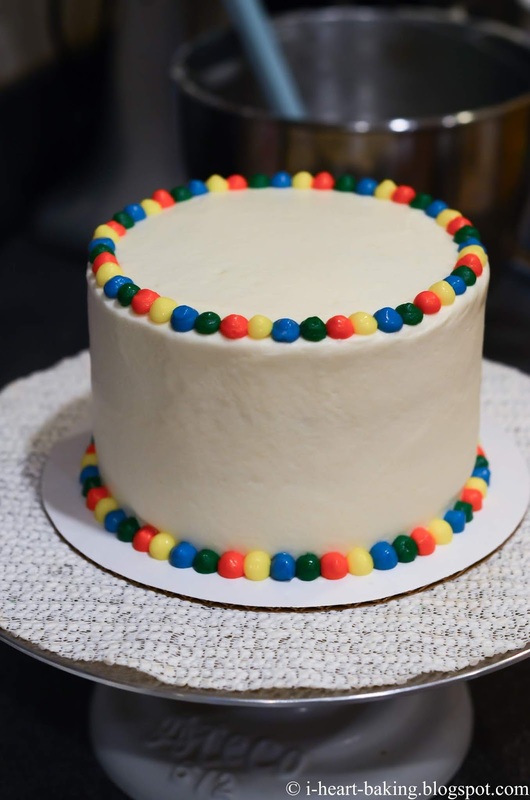 Then I divided the remaning frosting, tinted them with red, yellow, blue, and green, and using a medium round tip, I piped a rainbow beaded border on the top and bottom of the cake. 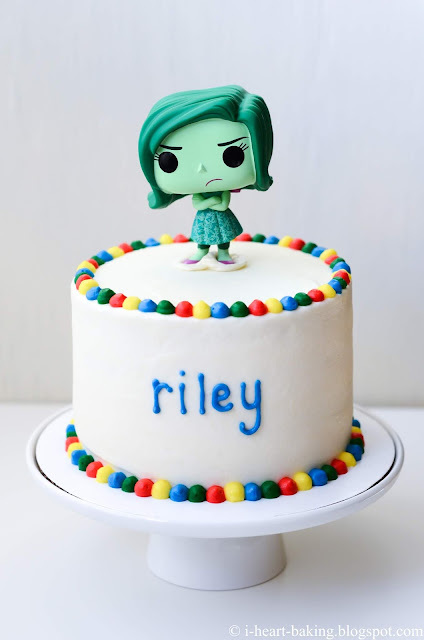 And then I added the cake topper. Since the base of the topper was pretty narrow, I couldn't find a good way secure it to the top of the cake, so I ended up melting some white chocolate, poured a dollop onto a silicone baking liner, and pressed the bottom of the topper into it while it was still melted. The once it hardened, it made a great flat and secure base for the topper to stay on the cake! 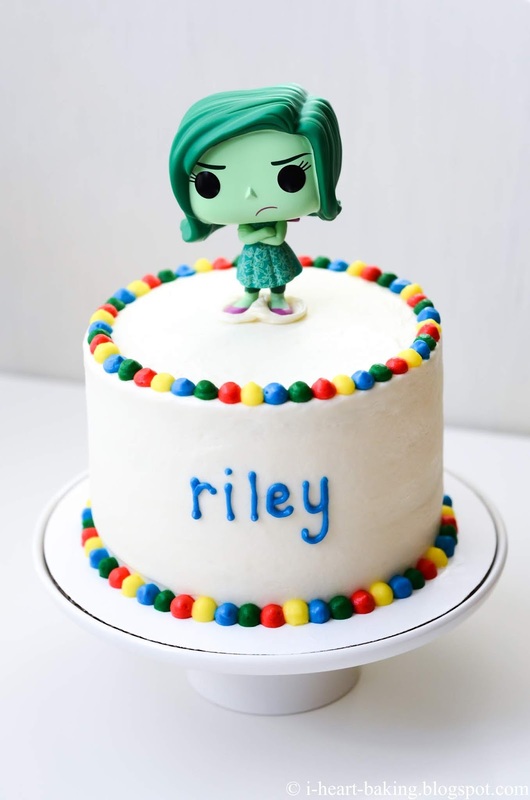 I just love these Funko Pop dolls! They are so adorable and they make great cake toppers! 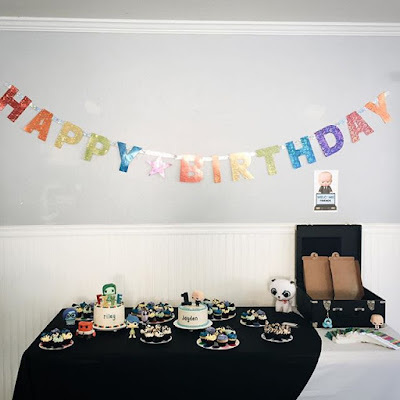 Happy Birthday, Riley! 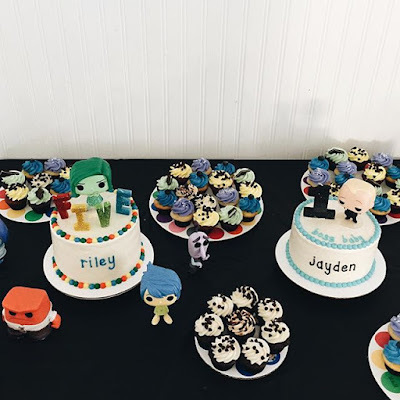 Hope you enjoyed your cake!